We have designed the perfect solution for connecting medical gas and vent lines to hyperbaric chamber installations – the Hyperbaric Valve/Outlets/Vent Box. 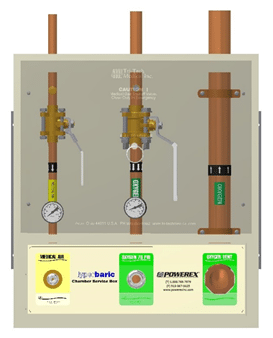 Designed with single point plumbing connections for fast easy installation and with a professional cosmetic look to make your Hyperbaric installation state of the art – the HCB incorporates Medical Air and Oxygen valves with gauges and DISS or an optional high flow (over 2,900 scfh) Oxygen outlet, along with a 1 ½” vent line. All outlets incorporate our unique Frontall™ front loaded cartridge design for easy and fast maintenance – without removing the front of the outlet. The window is “smoked” translucent removable plastic, providing access to the valves. All gas piping components are designed per NFPA 99 guidelines and cleaned per CGA G-4.1.